Wrangell St. Elias National Park and Preserve in Alaska from the air, shows the variety of distinct geological features that comprise this amazing region in southeast Alaska—glaciers, ice fields, alpine mountains, moraine, tundra...and that's just what you can see in this photo! 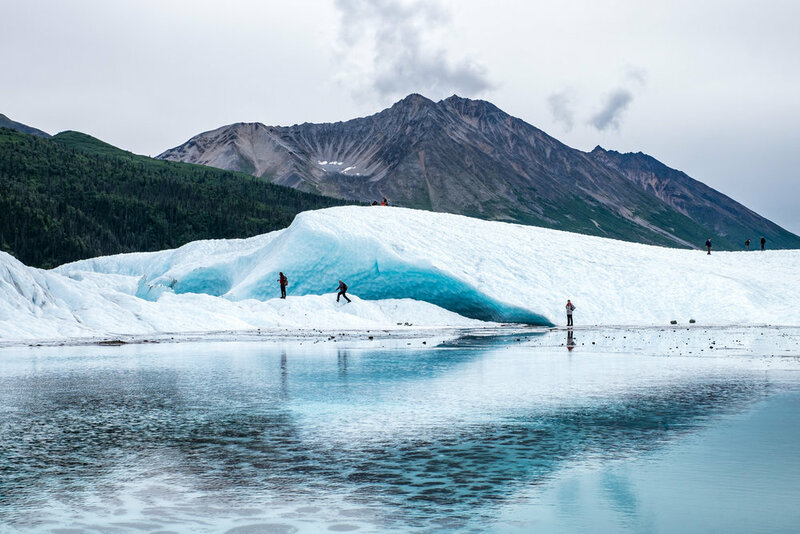 Everything about the terrain of Wrangell St. Elias National Park is menacing, from the drive in on McCarthy or Nebesna roads, to the rocky moraine, glaciers, and dense tundra that covers the landscape—you won't have a flat foot for the whole of your stay, if you do it right. 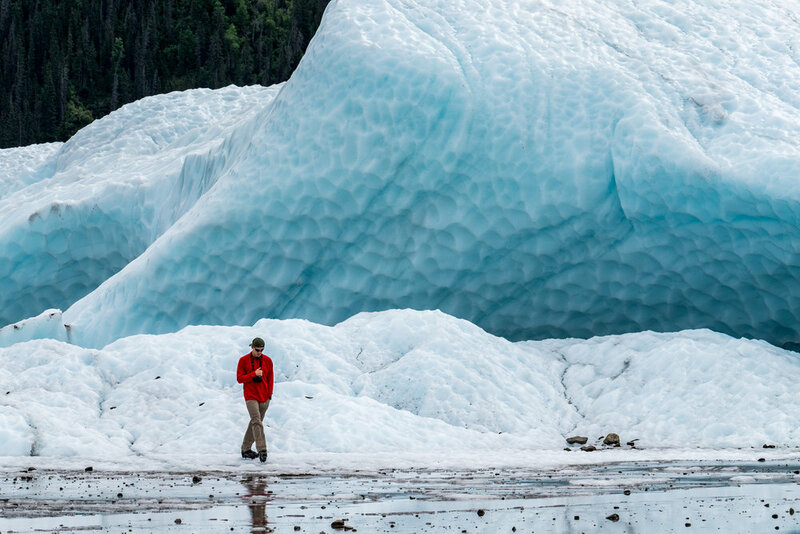 It’s not easy to explore a park as large as Wrangell St. Elias. 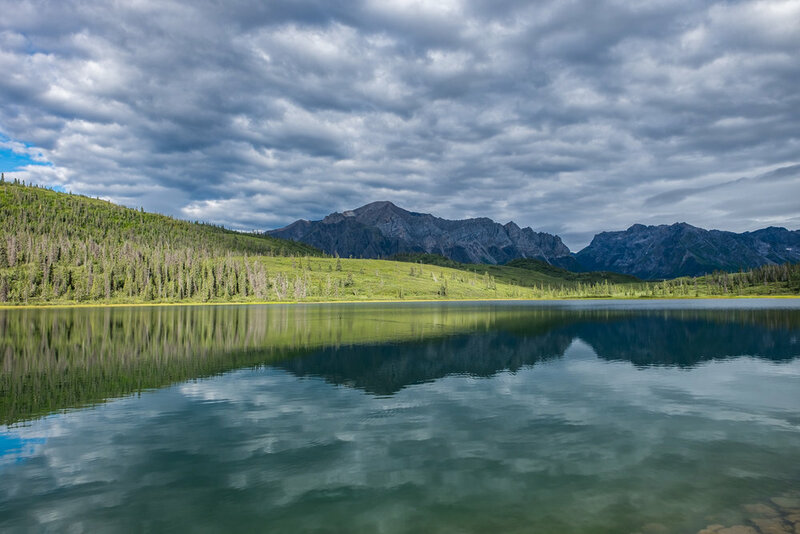 It is the largest national park in the entire system—more than 13 million acres—larger than each of the nine smallest states combined and the size of six Yellowstones. It contains nine of the 16 highest peaks in the United States and is home to 60% of the glacier ice in all of America. Fewer than 250 visitors visit the park on average per day (for context, Grand Canyon National Park might have one million visitors at any given time.) It’s the remotest of the remote. We could probably write this entire article using superlatives, but we’ll stop there and venture off instead into the topic of how much there is to do in this wild mountain utopia. 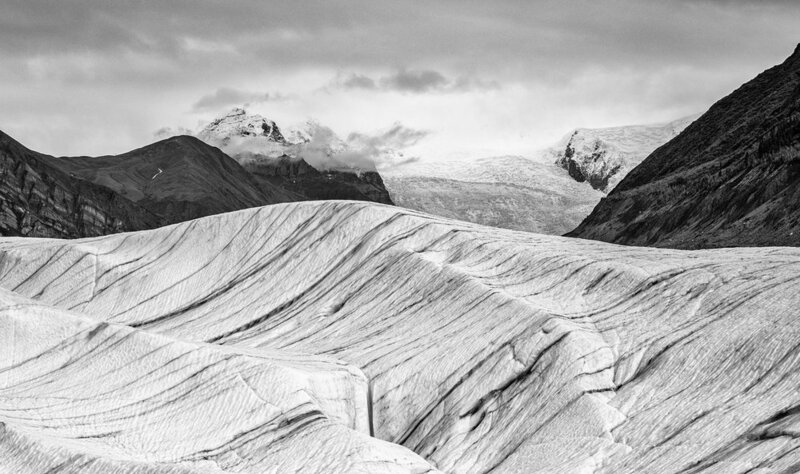 The rugged high-country is covered year round with snow, a most enticing feature to mountaineers, glacier explorers, ice climbers, and skiers. 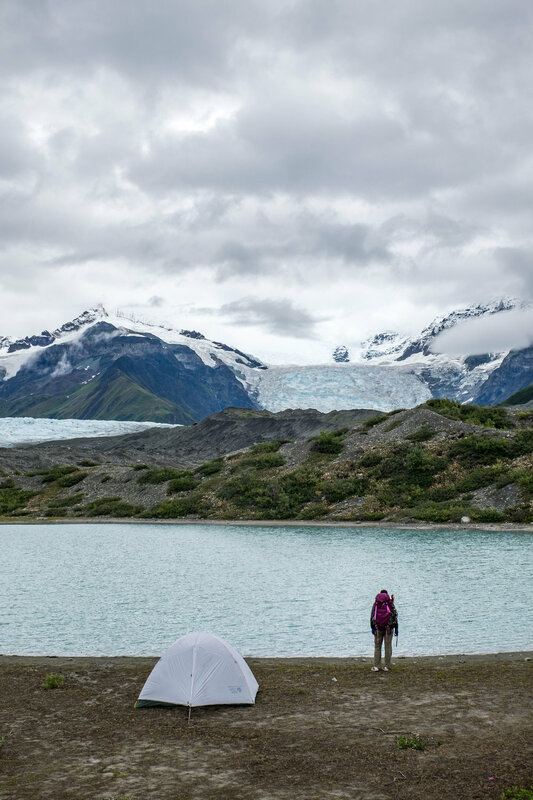 Where glaciers meet land, the water flows into braided rivers that weave throughout a tundra for people to paddle on and where backpacking is king. 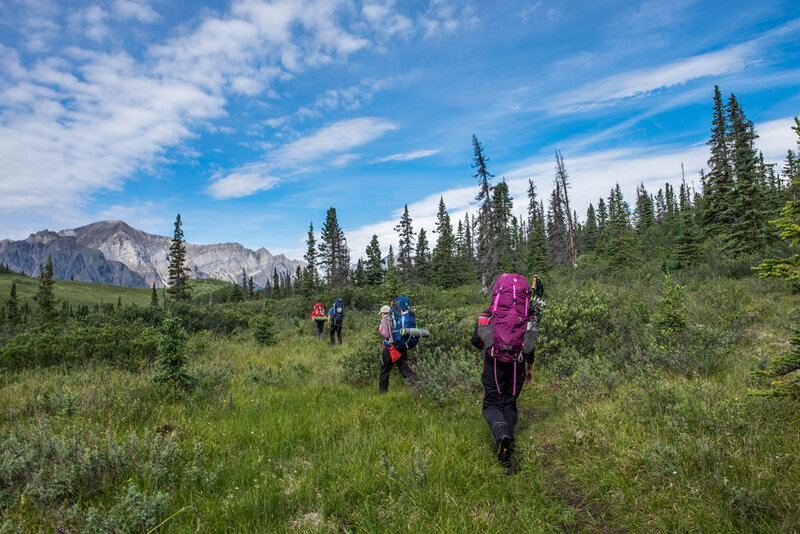 Trails are few, allowing experienced hikers freedom to blaze their own trails in backcountry. 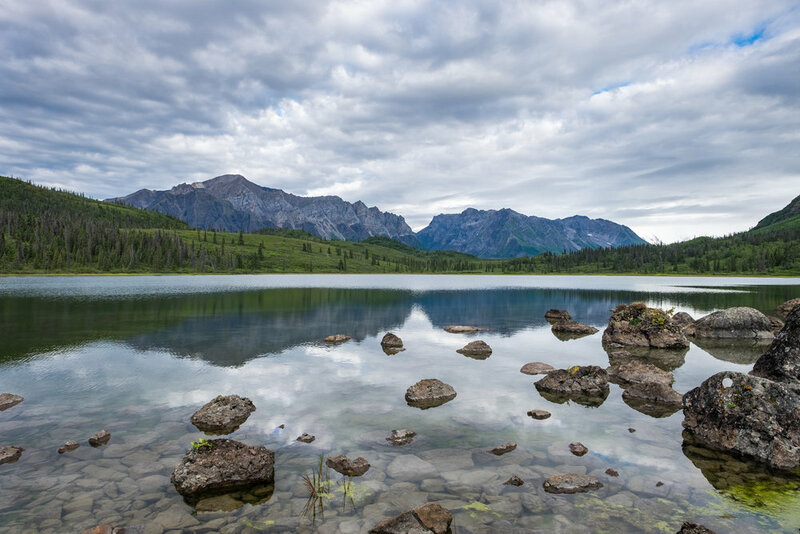 The diverse range of environments that trickle down from the high mountains opens up a world of hunting, fishing, and paddling opportunities for land-and-water loving adventurers. 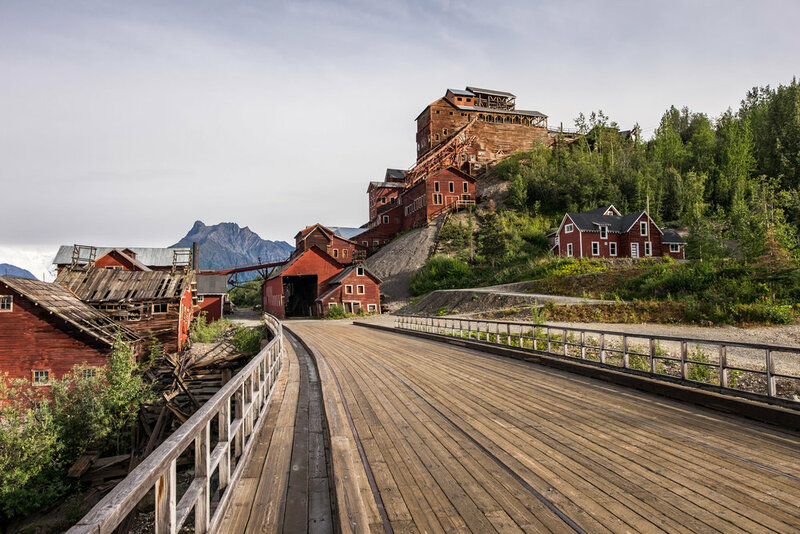 Cultural explorers get their fill in the historic town of Kennecott, the most accessible area in the park, where a turn-of-the-century copper mine that was all but abandoned in 1938 provides a glimpse into the history of the area and how communities of people came to live there. And to see a vast wilderness that is guaranteed to take your breath away, there are experienced bush pilots operating in the region to soar with you above it all. For this article, we wanted to outline three awesome adventures in a park that gave us one of our favorite experiences of the year and our lives. We’ve also included some general info including how to get there. 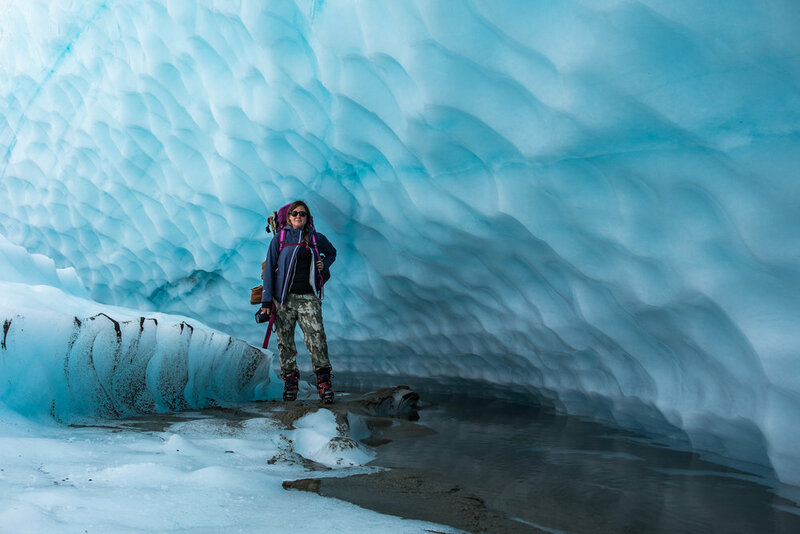 Support in Wrangell, as it is causally called, is days away once you are in the backcountry so it is vital to map a solid plan in advance of your visit. Park rangers and local guide outfits are on location to help you craft a great adventure. 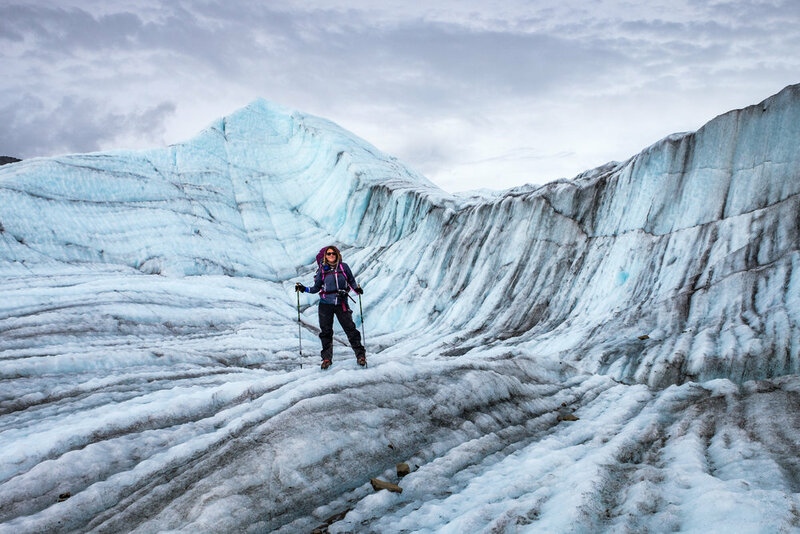 Because of its remoteness and challenging terrain, we recommend a guided adventure—which is what we did—to get the most out of your experience in Wrangell St. Elias National Park (check out McCarthy-based St. Elias Guides, the leaders of guided exploration in the area.) With that, a closer look at three awesome adventures! Stef learns to ice climb with her belay support standing below, a technical guide from St. Elias Guides named Kelly, an all-star climber and our backpacking guide through the park. Jonathan's view from the top of a 70-foot glacier wall he just climbed. 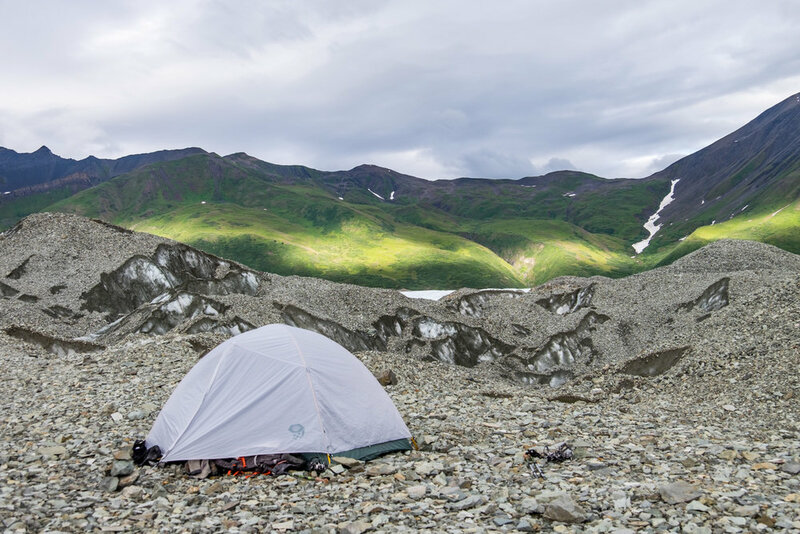 There are no developed campgrounds in Wrangell St. Elias National Park, so if you want to camp, you’ll be heading into backcountry—a most remarkable way to dive headfirst into a remote wilderness experience in this region. 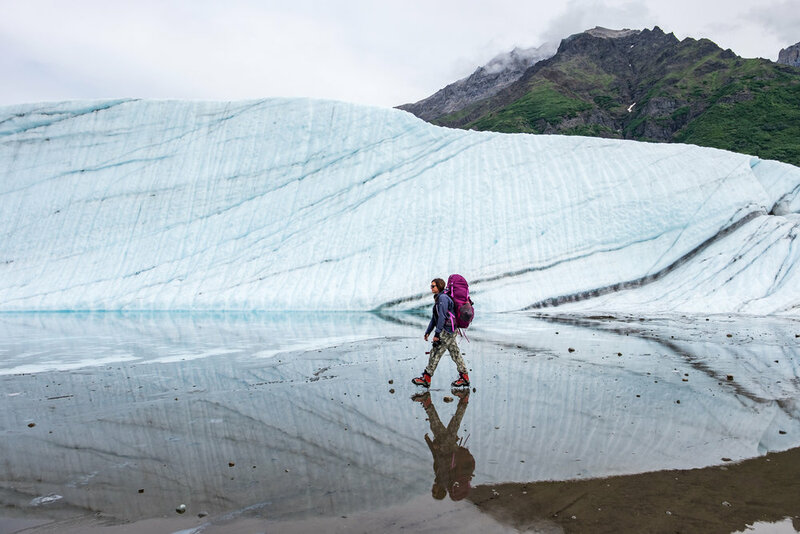 Depending on how your backpacking trip is designed, you will face a whole set of different kinds of terrain—thrashing through dense alder brush, challenging rocky moraines for traction, and walking on crispy glacial ice—it's like walking on a different planet. 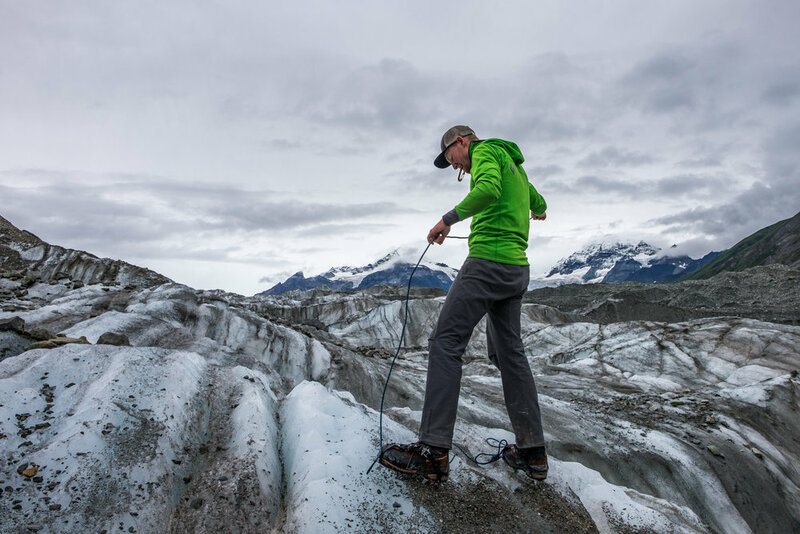 Our 5-day glacier/tundra backpacking adventure unexpectedly turned into a technical backpack as we had to incorporate ice-climbing techniques using crampons, an ice axe, and climbing rope to bypass unexpected obstacles (vertical glacier walls) while route finding our way across the Kennicott Glacier. 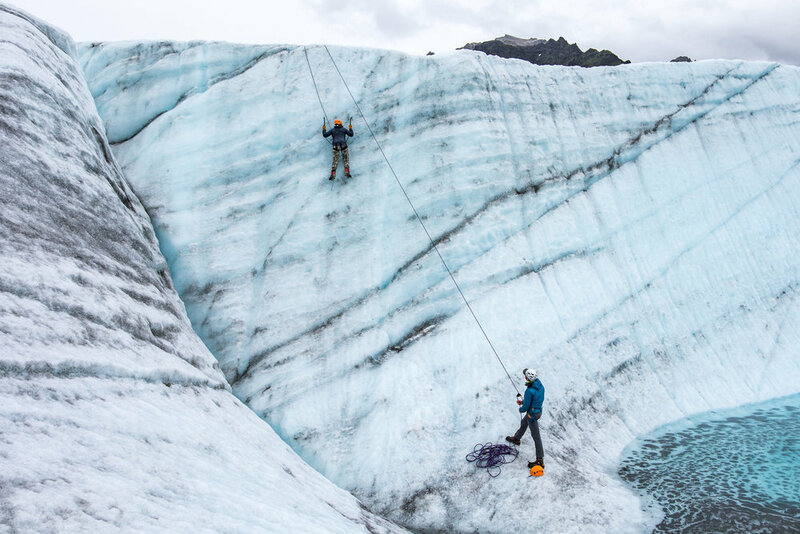 It's a good thing we learned some ice-climbing basics on day one. Yeehaw Alaska! There was no shortage of spills, cuts, bruises, blisters, headaches, lost and broken gear, lessons learned, and friendships formed along our journey—it was a most glorious foray into the Wrangell backcountry, a place that rightfully draws outdoorsman from all over the world. 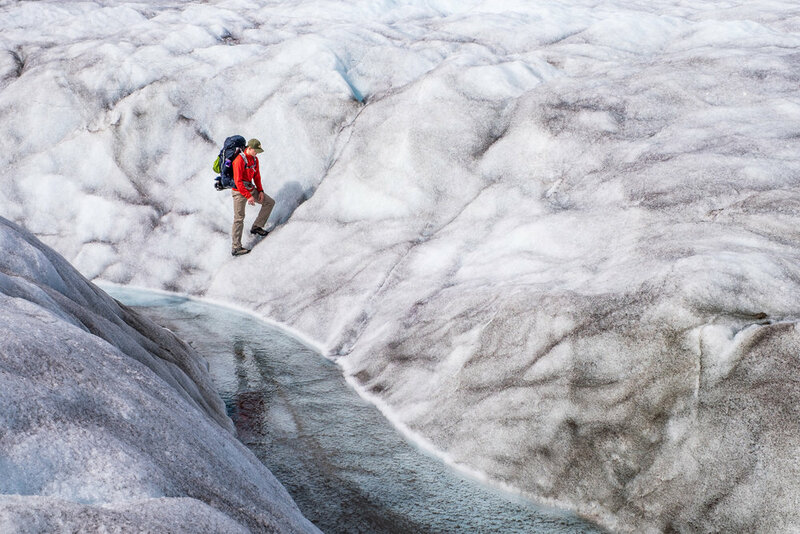 Traveling on foot across the Kennicott Glacier. Set up on top of a glacier high in the backcountry, our Mountain Hardwear Ghost Sky 3 tent lives up to its name. 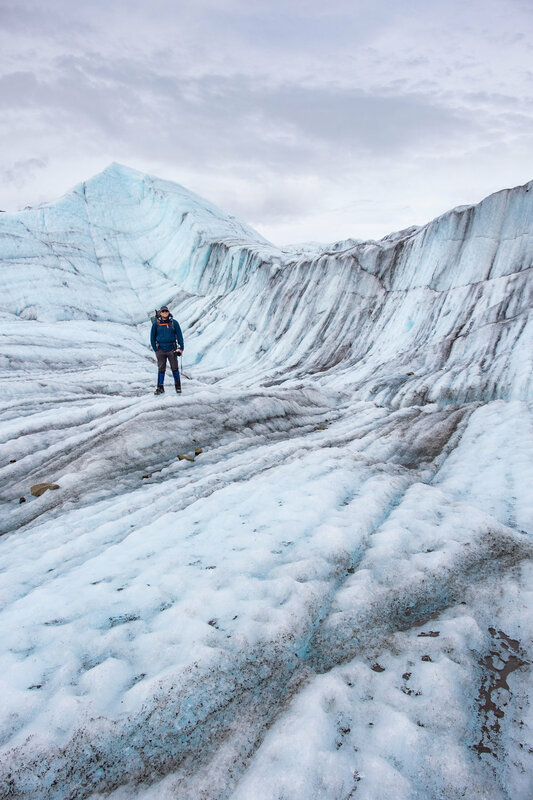 A flightseeing tour over Wrangell St. Elias will immediately open your eyes to how rough, wild, and vast America’s largest national park really is (and how tiny you are in comparison.) 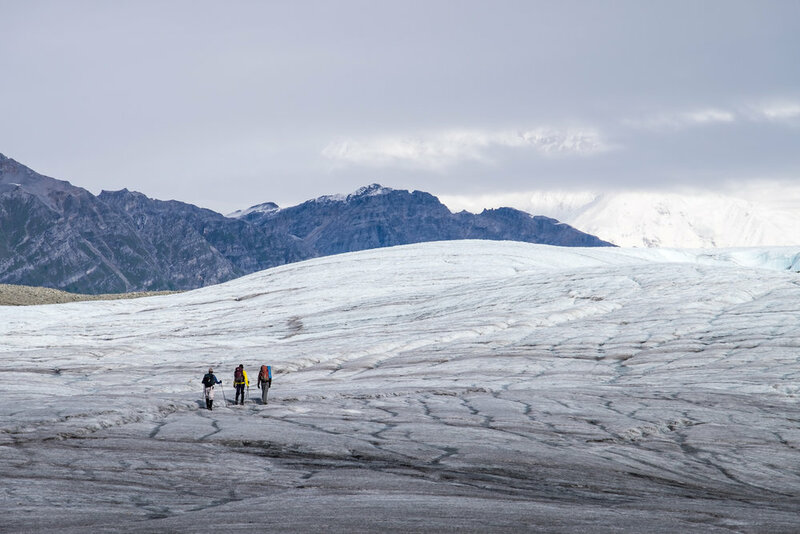 From this aerial vantage point you will see glacier after glacier, sharp mountain peaks, braided rivers, tundra landscape, and wildlife peaking out from its depths. 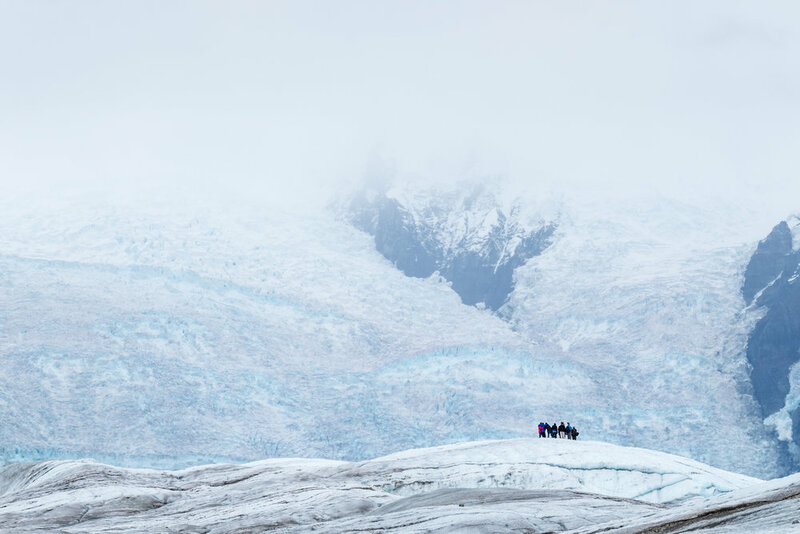 One great reason to hop on a bush flight is to see the Bagley Ice Field, the largest sub-polar glacier in North America. It is among the most impressive features in the park, geographically speaking, one that you otherwise probably wouldn’t see unless viewing it from the air. Talk about lending context to the experience of exploring the park on foot. Flightseeing in Wrangell St. Elias National Park with Wrangell Mountain Air. From the vantage point of the air, you start to get a sense of the massive scale, and just how rugged and remote this area of the Alaskan wilderness really is. 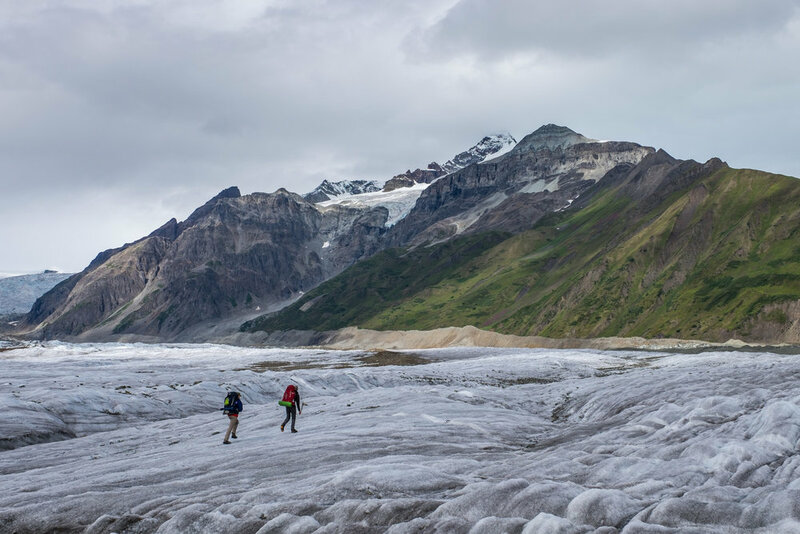 How to get there: Wrangell St. Elias National Park & Preserve is one of only three national parks in Alaska (there are eight in total) that is accessible by private vehicle, though it is not always an easy road to get there. 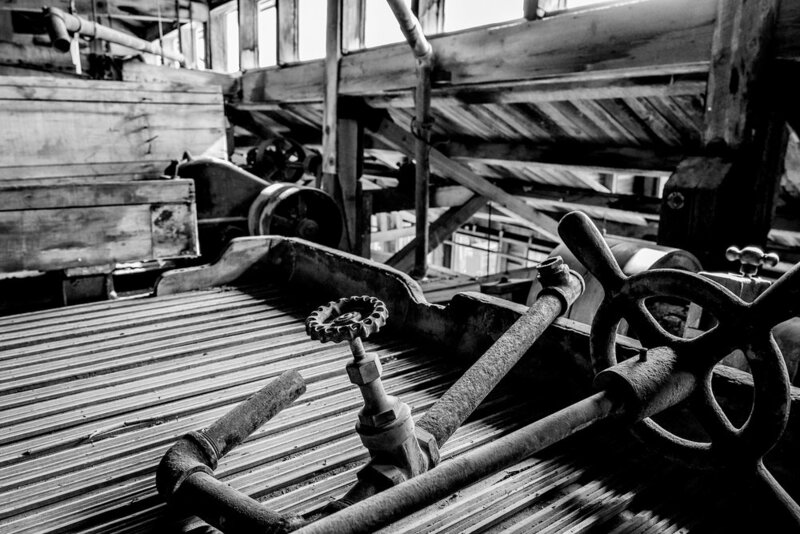 The central landing spot in the park is in the town of Kennecott, where you will find the park visitor center that resides in the relics of more than 40 restored abandoned mine sites (where the National Park Service offices are also located.) 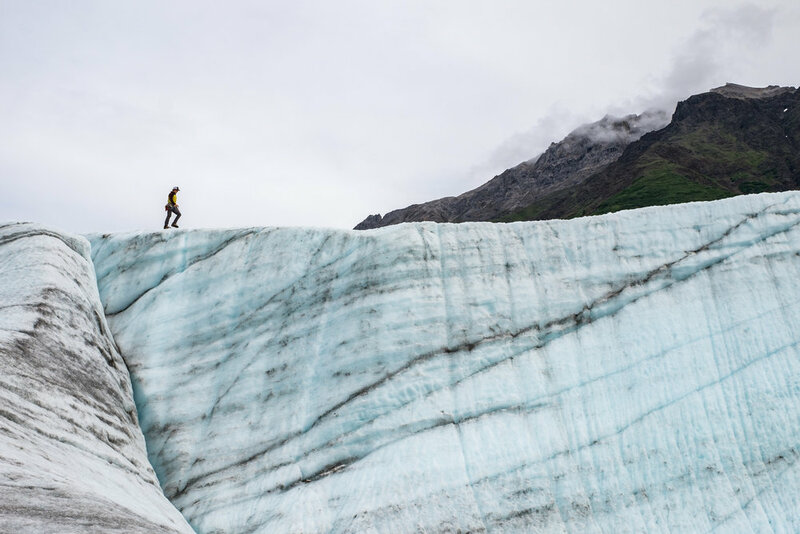 Kennecott is located just a couple of miles from the start of the Root Glacier and will be the jumping off point for most of your backcountry- and glacier-based adventures. To get there, you will need to either fly in from adjacent towns or drive in on one of two primitive roads—Nebesna and McCarthy roads. 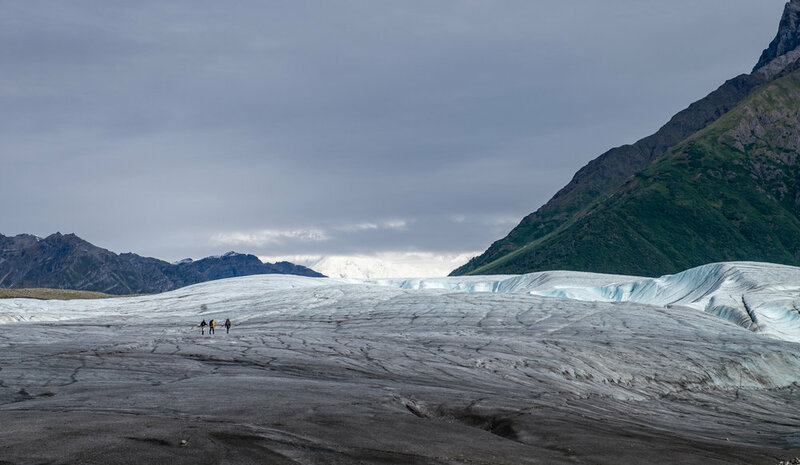 Both are rough and tumble, both are an experience in and of themselves, and both are managed by the state of Alaska rather than the park service—though do check in with the park service in advance to get a status of driving conditions, recommendations for RV’s and travel trailers, and always carry a spare! Nebesna Road is 41 miles of gravel road starting in northern town of Slana. McCarthy Road is 61-miles long starting in the western town of Chitina. 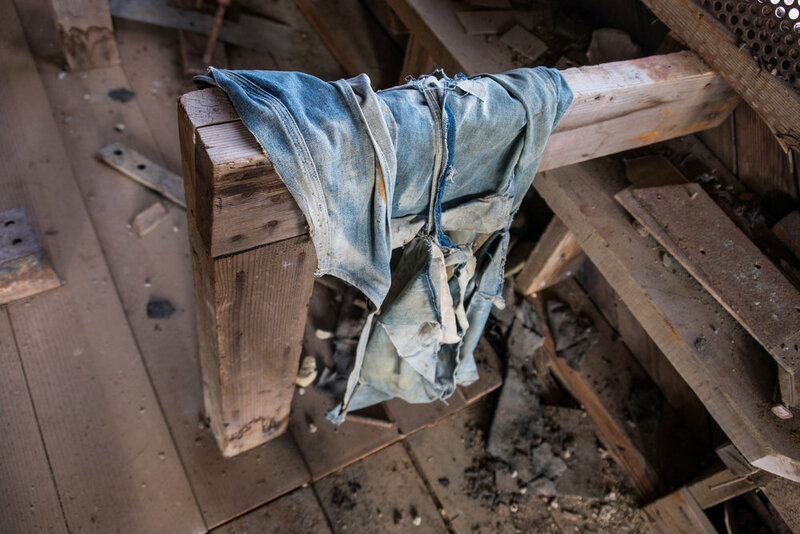 It is potholed, pockmarked, washboard, and is not regularly maintained. We took a leap of faith and drove the road with Wally the Airstream in tow—it is where he endured his first flat tire of the year! Happy trails and safe travels everyone! Starting the long, brain-shaking drive down McCarthy Road into the heart of Wrangell St. Elias National Park with Wally the Airstream in tow. 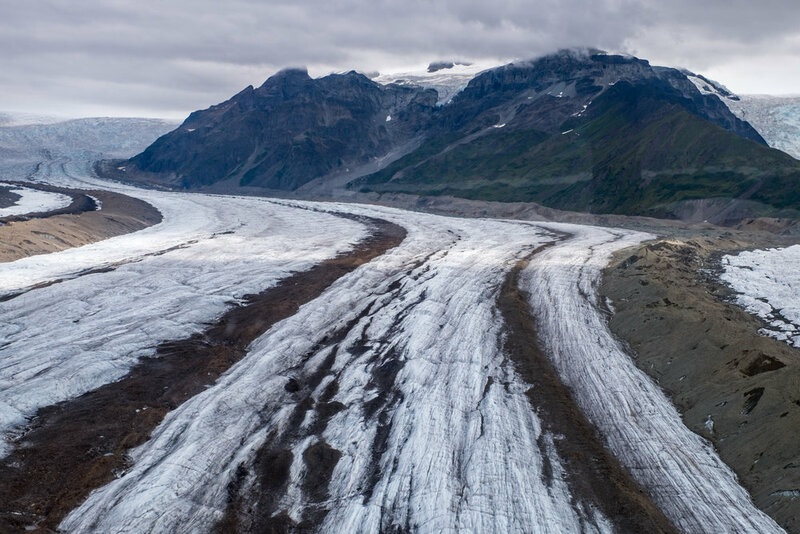 How to get there: Wrangell St. Elias can be reached from Anchorage via the Glenn Highway, or from the Alaska Highway cutoff at Tok coming in from the north. Once at either of those two entrances, drive either the McCarthy Road (61 miles) or the Nebesna Road (45 miles) to get into the heart of the park at Kennecott. 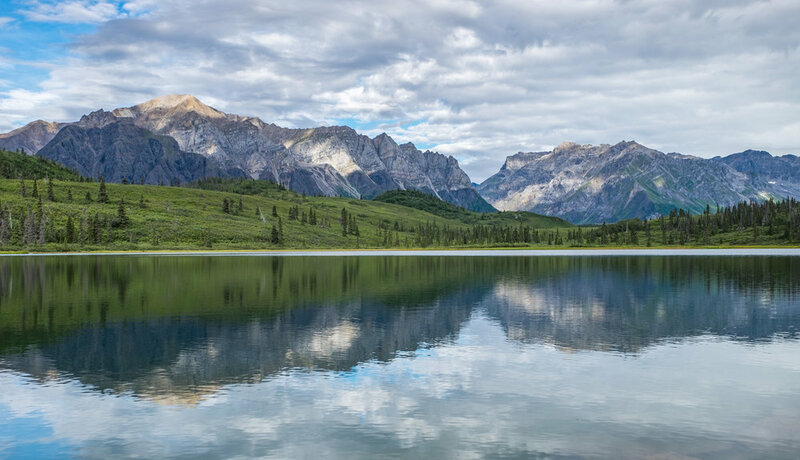 How the park got its name: Wrangell St. Elias National Park was named after two mountain ranges that form the spine of the park: the Wrangell, and the St. Elias Mountain ranges. 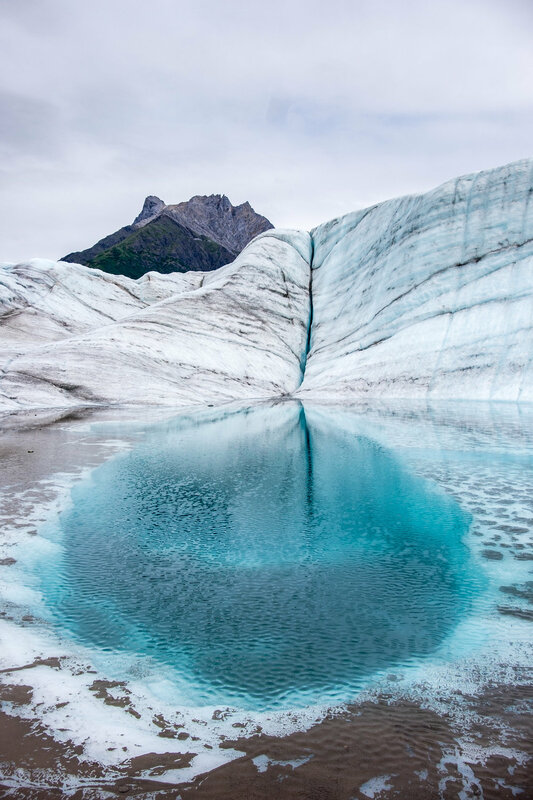 The largest sub-polar ice field in North America and one of the most distinct features in the park: The Bagley Ice Field. 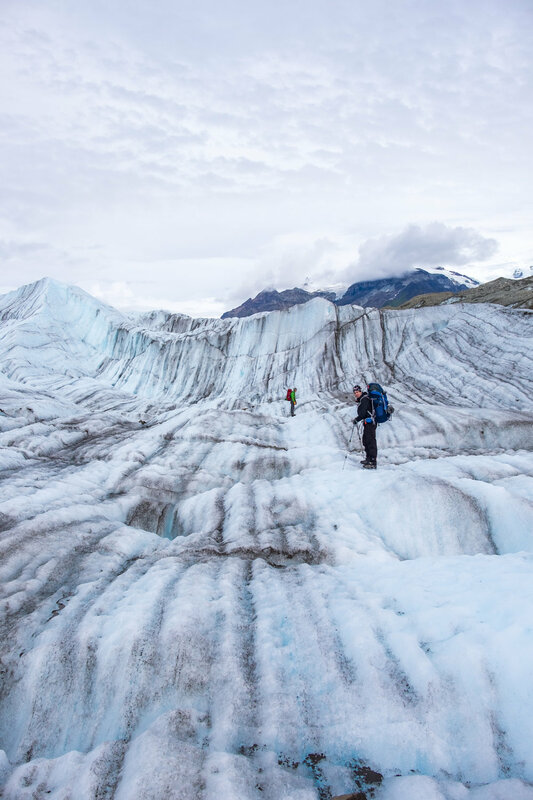 Iconic site in the park: The Bagley Ice Field stretches far across the park’s interior, and is the largest non-polar ice field in North America. 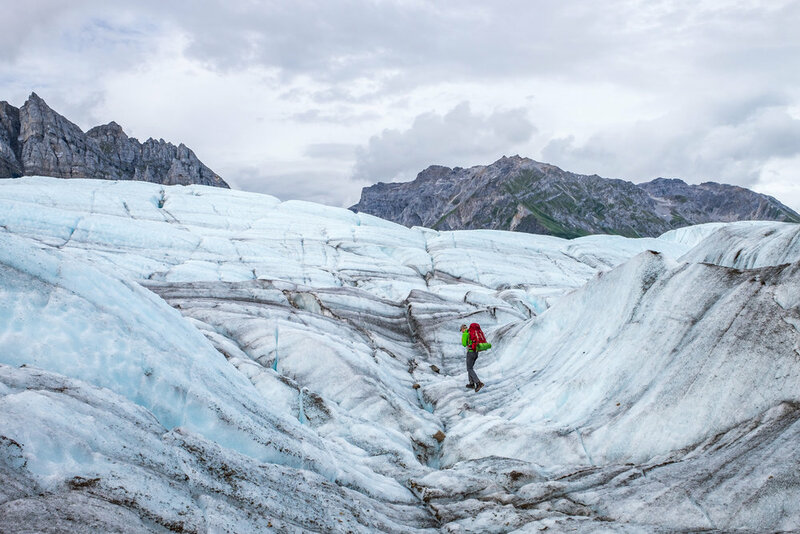 Its 3,000-ft thick ice sheet covers most of the St. Elias Mountains, and some of the Chugach Mountains, providing a source of massive glaciers including the Tana, Hubbard, Guyot, and Miles—otherwise known as playgrounds and for mountaineers and ice climbers to hatch new "objectives." 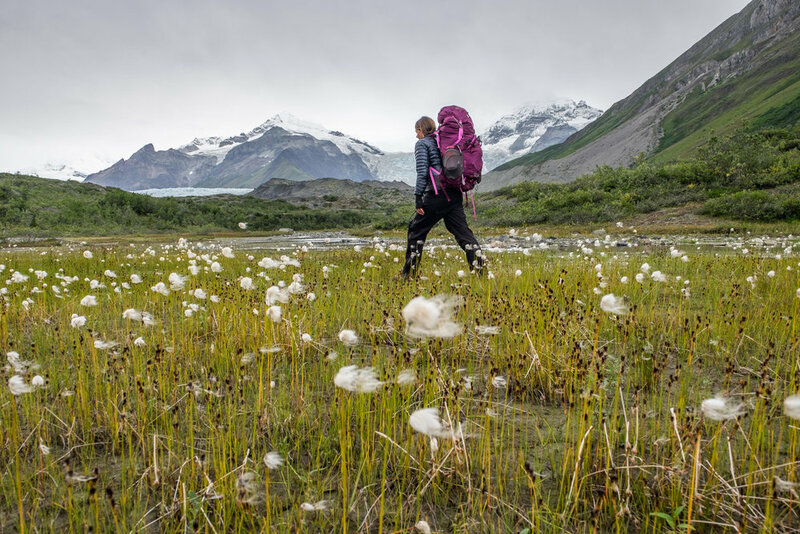 Stefanie walks through Eriophorum, Alaskan cottongrass, also known as "Einstein plants" en route to an alpine lake where we will camp for a night before moving on to the next camp site. 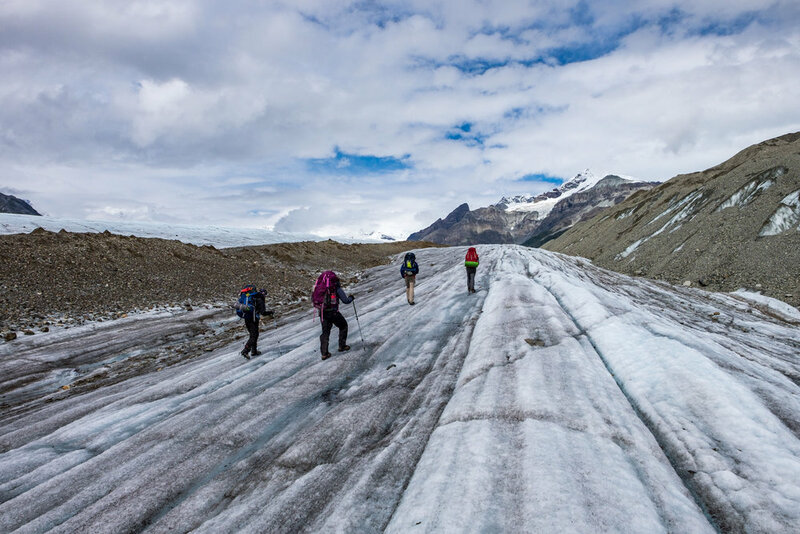 Big adventure: If you want to really dig into the Wrangell St. Elias wilderness and have an intimate experience with the environment, head out on a 5-day backpacking trip across glacier and tundra with St. Elias Guides. 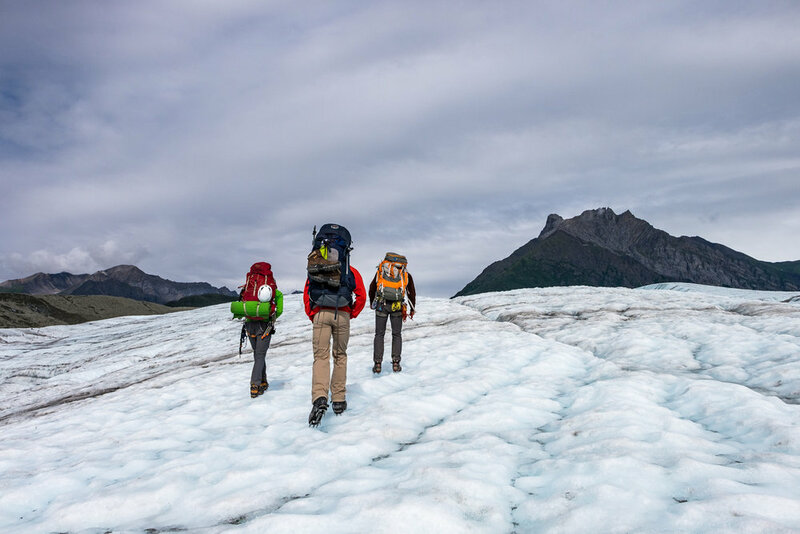 In just a few short days you will cross portions of the Kennicott Glacier; Root Glacier; and Gates Glacier, while climbing up and down rocky moraine (shale covering glacial ice) and blazing trails through dense thickets of alder brush. 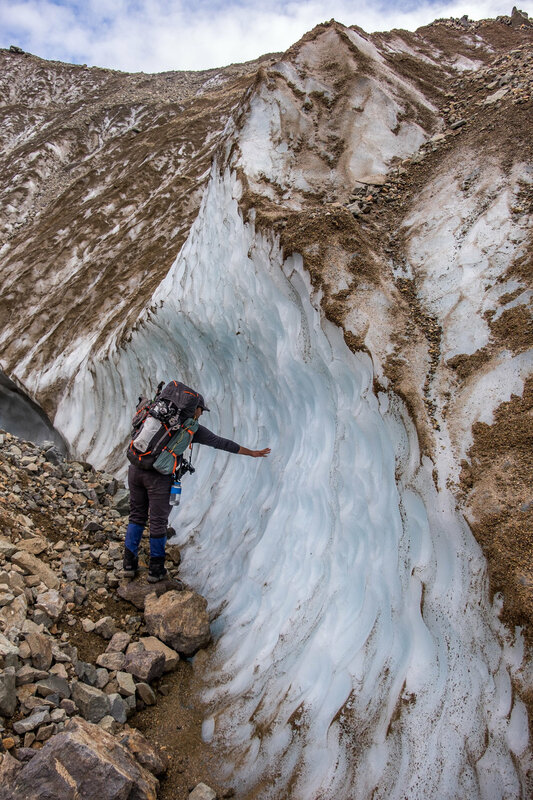 This kind of terrain requires tremendous physical output and you will sleep ever so soundly each night after full days making glacier/moraine/tundra/river crossings—laying your head down in a tent positioned atop glaciers and aside alpine lakes. If you want to get to know many types of terrain in a relatively short amount of time and challenge your body and mind at the same time, this is your jam. 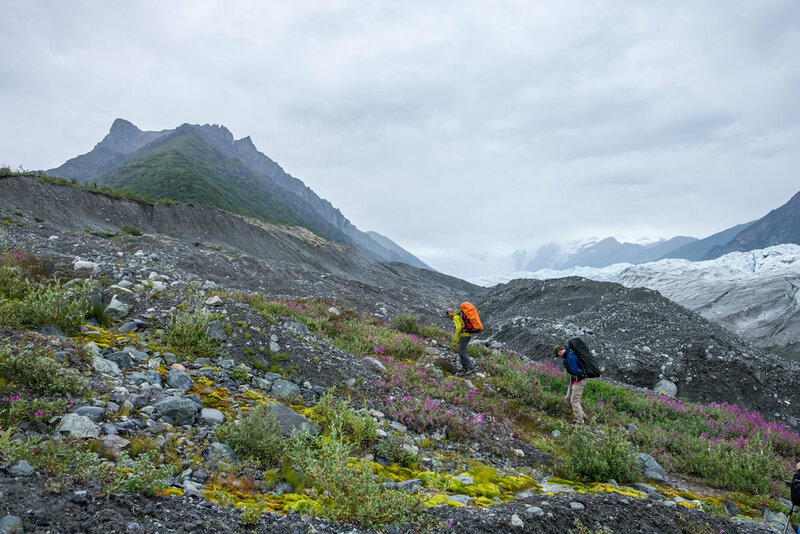 The St. Elias Mountain range gives way to glaciers and moraine. See that vertical spread of white and brown strips? We crossed all of that during our five day backpacking adventure. Awesome!! 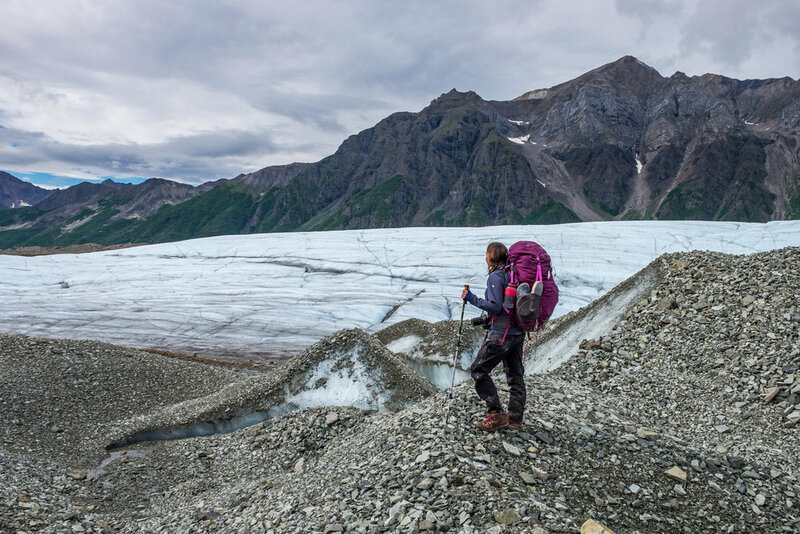 Wrangell St. Elias National Park and Preserve is America's largest national park, more than 13-million acres in size. It is larger than Vermont and Rhode Island combined and is six times the size of Yellowstone National Park. 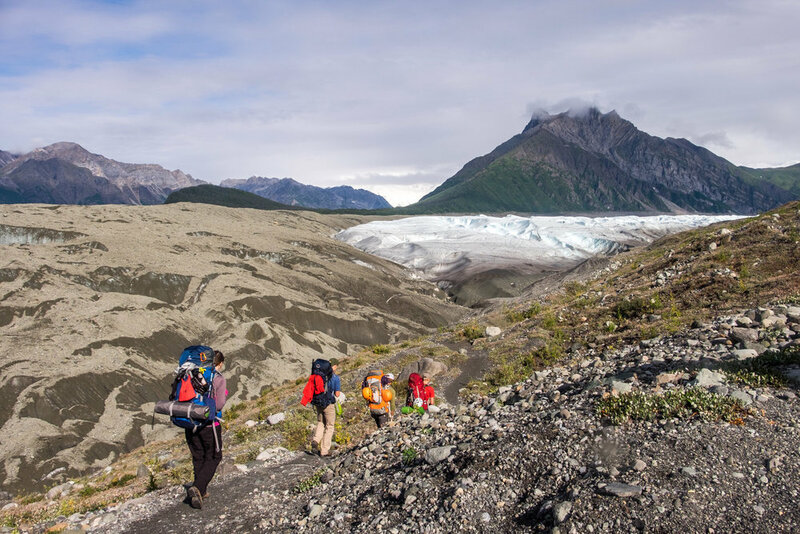 Most of Wrangell St. Elias National Park is accessible only by bush plane or on foot. 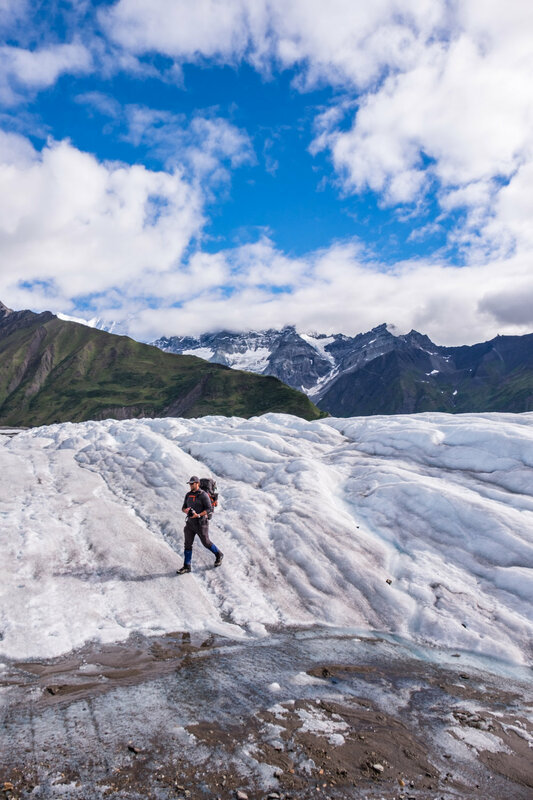 Four major mountain ranges meet in this national park: The Wrangell’s, St. Elias, Alaska, and the Chugach Mountain Ranges, the last of which is among the most accessible ranges in all of Alaska. 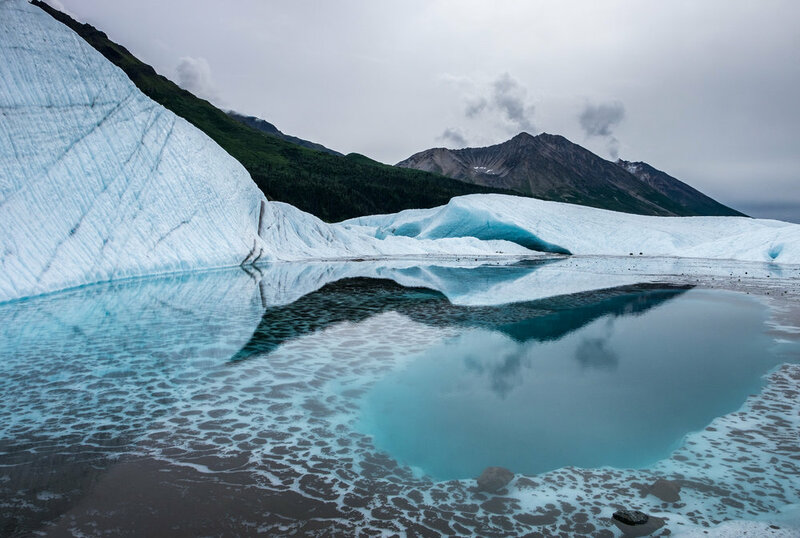 Wrangell St. Elias is one of four protected wilderness areas making up the world’s only bi-national UNSECO World Heritage Site, covering 24 million acres. 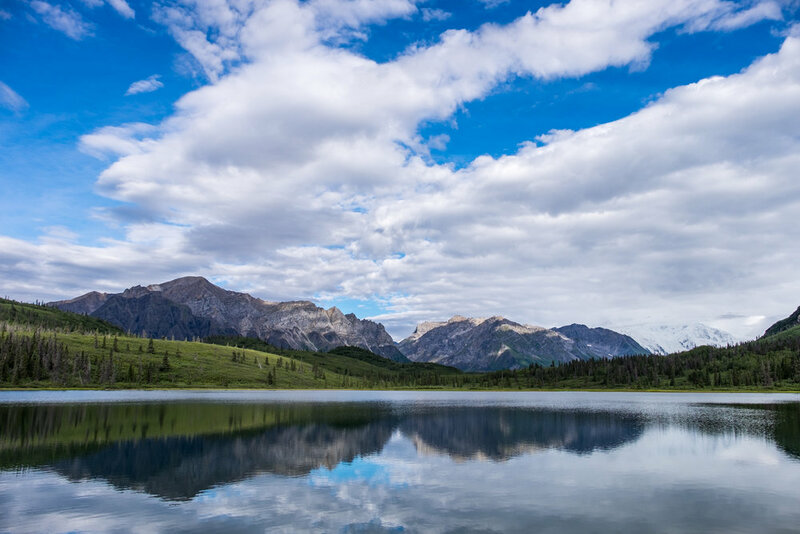 The other three are Kluane National Park and Tatshenshini-Alsek Provincial Park, both in Canada, and Glacier Bay National Park in coastal Alaska. Mount St. Elias — the second highest peak in North America behind Denali. Mount St. Elias is the second highest peak in the United States after Denali (20,320-feet). 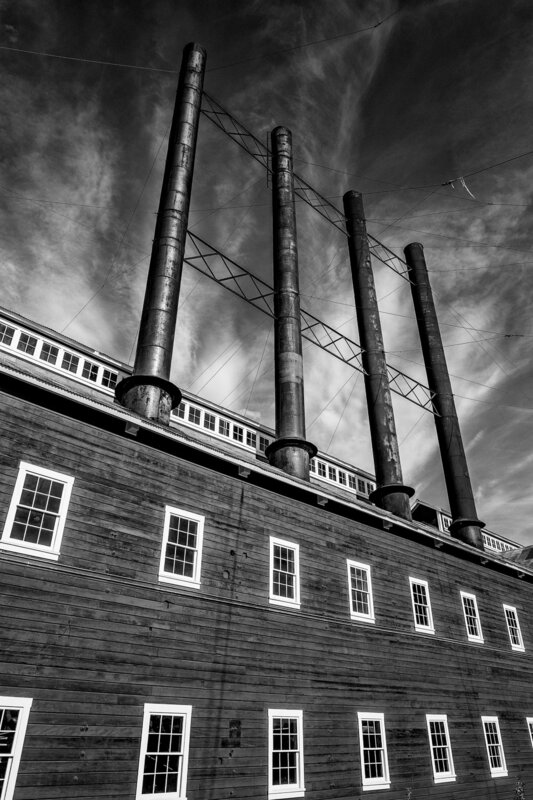 It stands at 18,008 feet tall. Mount Wrangell is among the largest active volcanoes in North America. 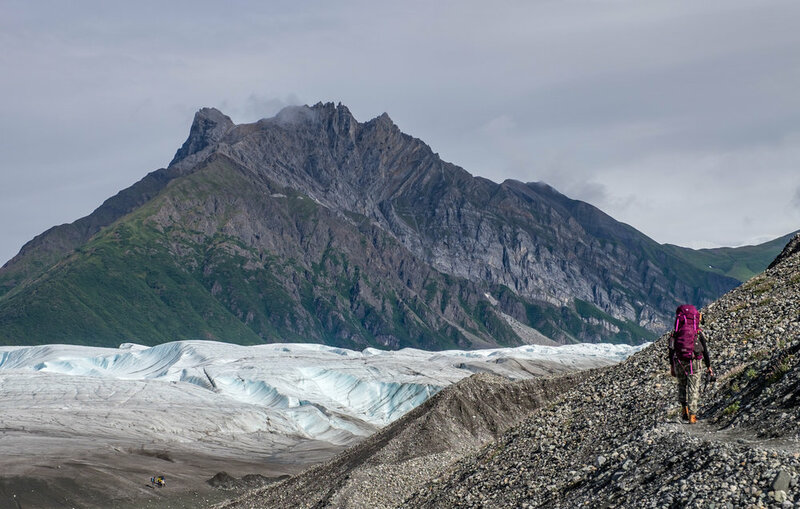 The largest concentration of peaks above 16,000-ft in any U.S. National Park exists in Wrangell. 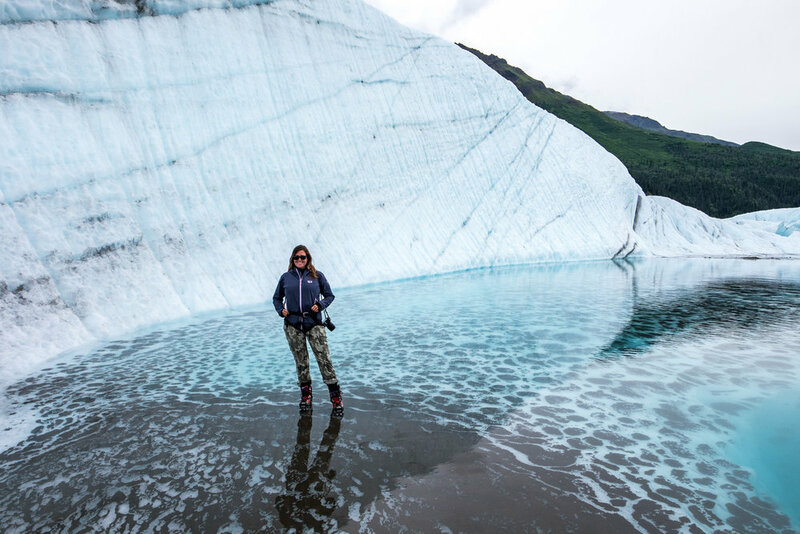 Wrangell is home to third largest icefall in the world. 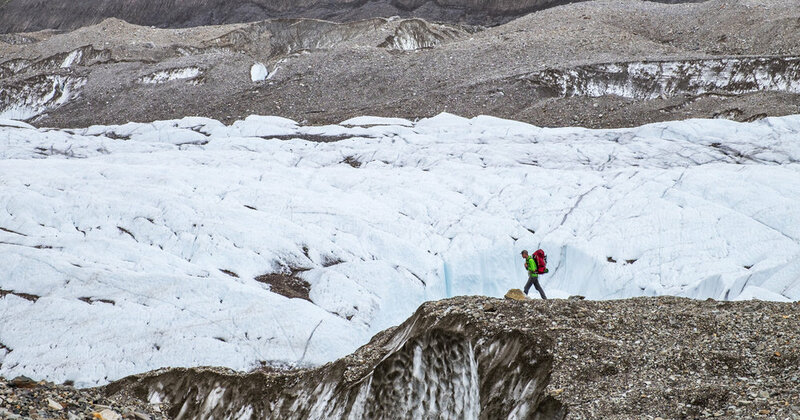 Most of the glaciers in the national park are in retreat. 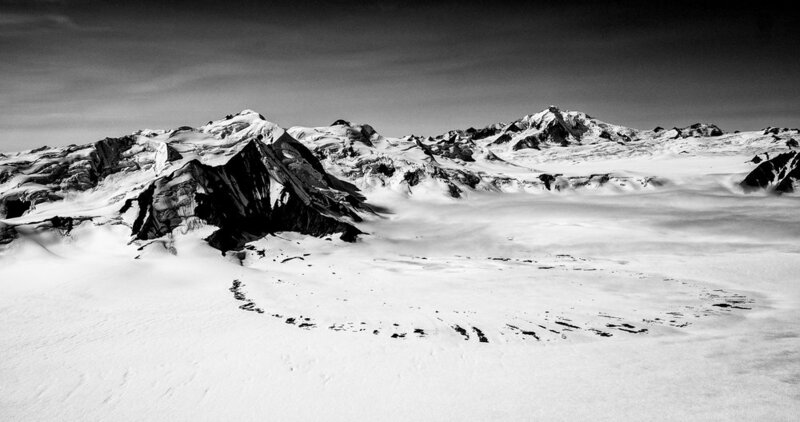 There are so many incredible mountains in Wrangell St. Elias that most of them are unnamed. Plenty of opportunities for first ascents out there! Dora Keen was the first, not the first woman but the first human, to summit Mount Blackburn in May of 1912. She is one of the great alpinists of all time. 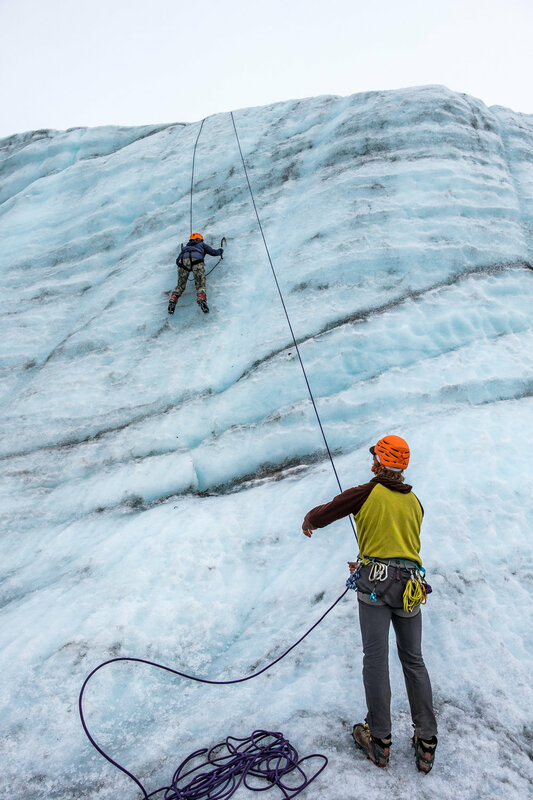 The term "mountaineering" refers to exploration of mountains and glaciers. 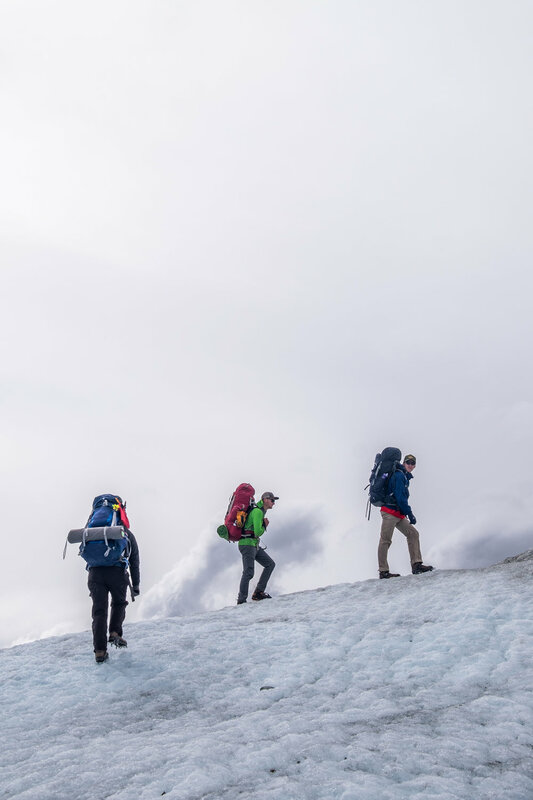 Mountaineers are typically driven by a basic question/answer scenario—the question, "how do I meet my objective?" (the objective meaning, the destination.) 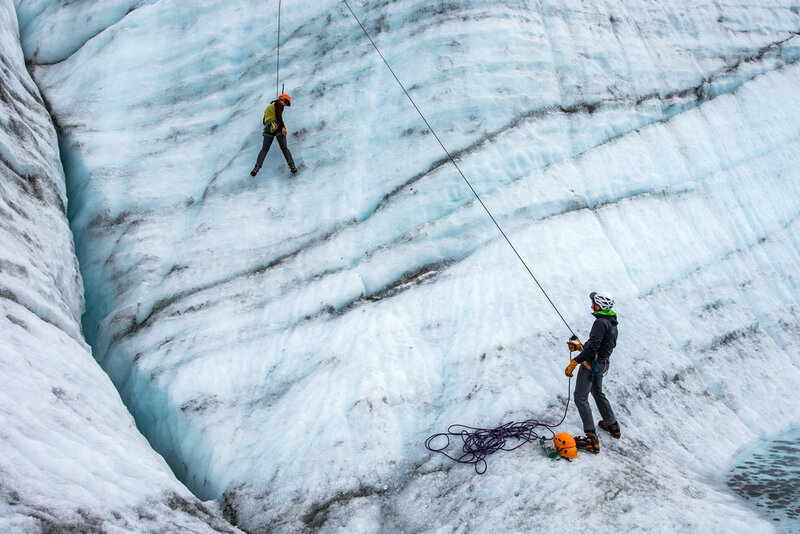 The answer is the result of the tools and techniques used to get there—technical climbing, hiking, river crossing, repelling, etc. 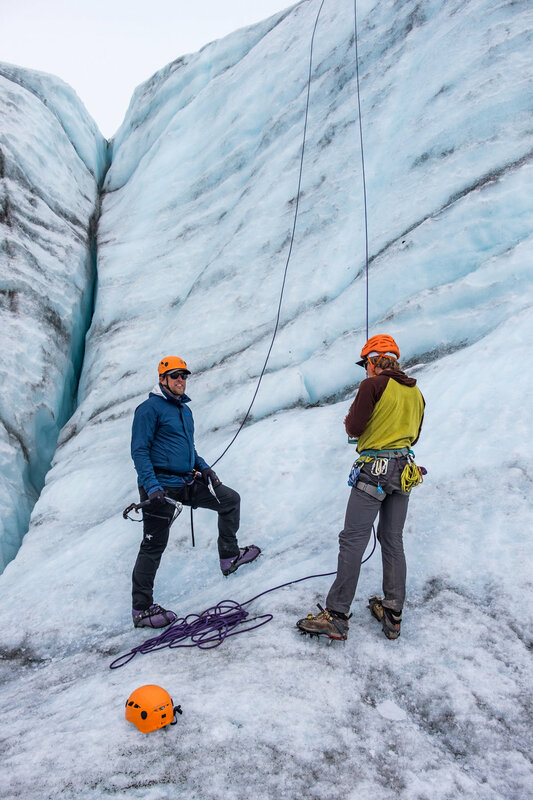 A certification from the American Mountain Guiding Association (AMGA) is like having a Ph.D. in guiding for technical climbs and mountaineering, on and off the ice. 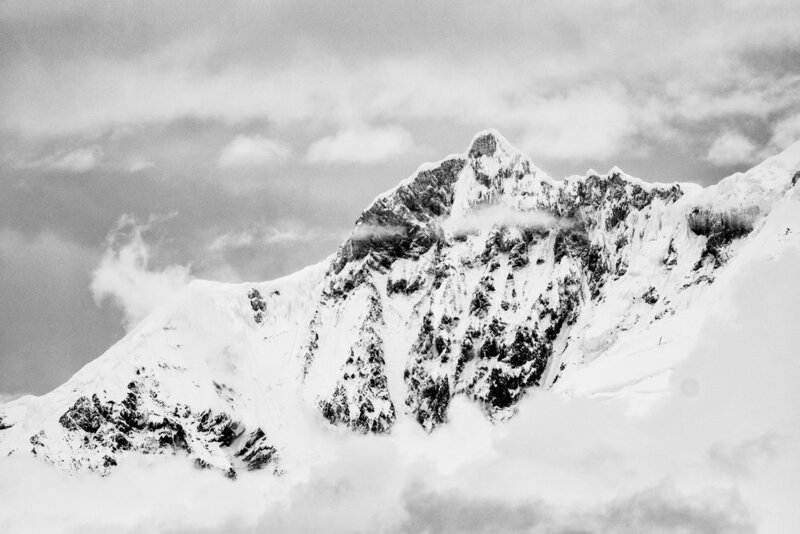 The International Mountain Guide Federation (IMFGA) acquires the best alpine mountain guides from every member country and represents approximately 6,000 brave souls who keep adventurers safe at Earth’s highest rooftops. Derek, one of the experienced guides and wizard climbers with St. Elias Guides, kept us safe with a belay while ice climbing a 70-foot wall. Some ice climbing terminology! A kilonewton is a measure of force typically used in physics (and developed by Sir Isaac Newton) denoting the possible tow weight of climbing ropes. 222 pounds = 1 kilonewton. A “dressed knot” refers to a knot that is cinched tightly and in its safest form. A "belay" is a kink in a knot used to create friction, or tension, in a climbing rope. It also refers to the place where the belayer is anchored. Bush pilots are the wise owls of Alaska—they see everything. 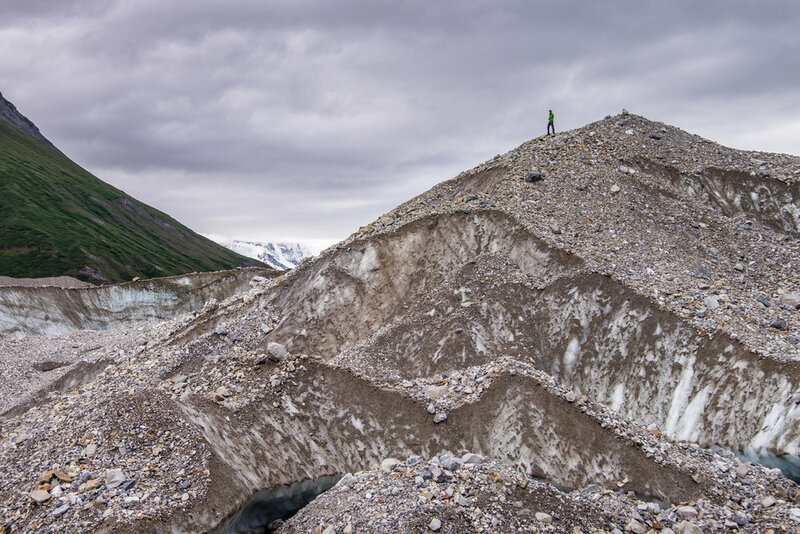 They know when rivers are flooding, when glaciers are retreating, when migrations are occurring; rockslides, mudslides, freezing—they see it all first from their homes in the skies over Alaska. Though it is avoided because it is not their mandate, they are often mobilized for search and rescue activities. Paul Claus, dubbed “The King of the Bush Pilots” has been flying bush planes in Alaska all his life and is regarded by National Geographic as a genius at performing glacier landings. Claus has flown NASA researchers and scientists into remote areas in Alaska to conduct studies, most notably on a project called Operation IceBridge, an air-based science mission seeking detailed analysis of ice. “The Fosse” is of local legend in Kennecott and McCarthy and refers to an airplane landing strip located on the other side of the Kennicott Glacier from the town of Kennecott… a “fosse” is a geological formation, which according to Dictionary.com is defined as a fortification, usually filled with water; or any ditch, trench, or canal. Sounds like a good place to land a plane to me! Did you notice in the last bullet that Kennicott was spelled two different ways? Kennicott Glacier, Kennecott Valley, MV Kennicott (a ferry vessel), and the Kennicott River were all named after American naturalist and zoologist Robert Kennicott to commemorate his scientific efforts in the area. The historic mining town of Kennecott was misspelled during its official dedication, with an e instead of an i. 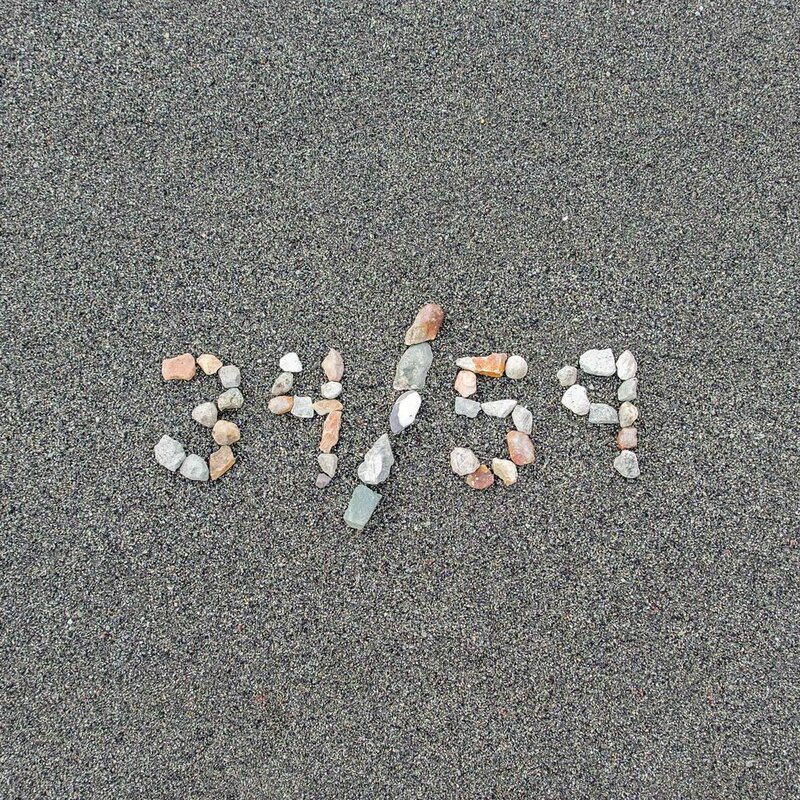 The geographic formations and the sea vessel retain the intended spelling. 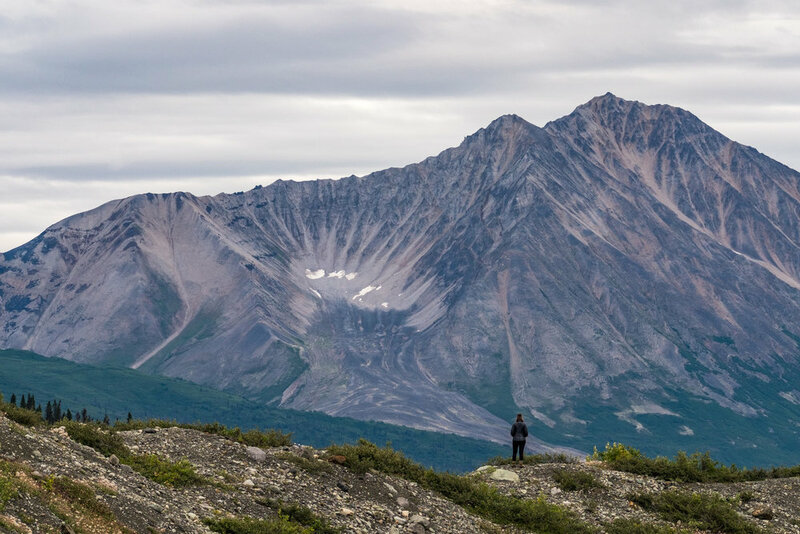 Wildlife in Wrangell St. Elias includes moose, grizzly and black bears, caribou, and Dall sheep, among other smaller creatures, birds, insects, and fish. It was the gold rush in 1899 that brought attention to the Kennecott area turning it into a prolific site to mine copper. More than a billion-lbs. of ore were extracted from the mines during its 27-year operation, with upwards of 100 million dollars in revenue being brought in during that time. 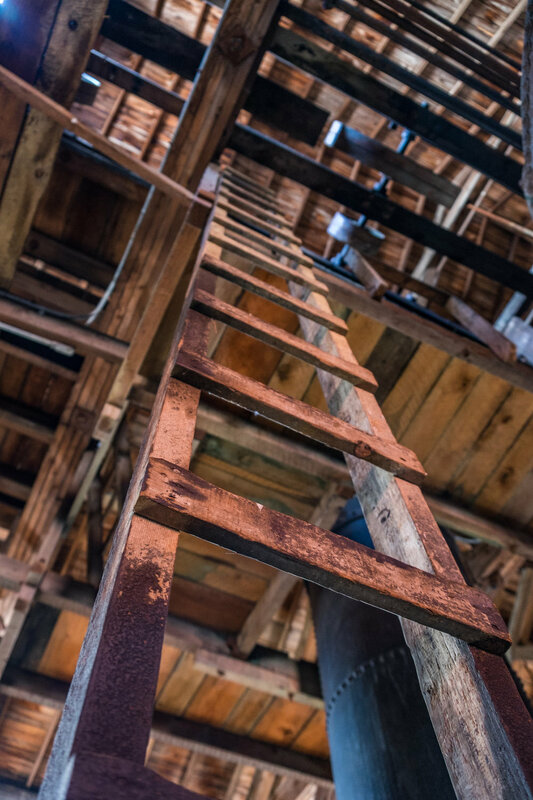 The mine site still stands in the town of Kennecott; the Kennecott Mill is the tallest free standing wooden structure in North America. The operation was so loud that the thundering sounds could be heard 24/7 in the nearby town of McCarthy located 4.5 miles away. The mines are listed on the National Registrar of Historic Places. Car rental agencies forbid their fleet to be taken down the notoriously grizzly McCarthy and Nebesna roads. McCarthy Road was the inspiration for the acclaimed book The Road to McCarthy: Around the World in Search of Ireland published by Pete McCarthy in 2004. Another fascinating and somewhat disturbing book about the town of McCarthy is Pilgrim's Wilderness: A True Story of Faith and Madness on the Alaska Frontier by Tom Kizzia. Produce (fruits and vegetables) are somewhat of a rarity in Alaska as very few are able to grow it well due to the harsh climate. Locals stores often make big runs to Costco in Anchorage to stock up and to resell in smaller towns... such as in McCarthy. Read more about McCarthy and the road that will take you there in our article in the Stops Along The Road section of this website.